How To Turn Around A Tech Giant? With Empathy, Microsoft CEO Satya NadellaSays : All Tech Considered The CEO of Microsoft was hired to turn the company around. And now, just three years into the job, Satya Nadella has written a book reflecting on this monumental task — and the empathy it requires. In his new book, Microsoft CEO Satya Nadella explores how he's had to work on his capacity for empathy to change the company's culture. 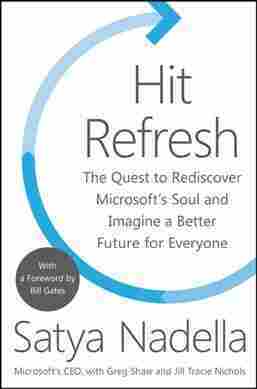 Satya Nadella's new book is called Hit Refresh (like when you reload a webpage). And in it, the CEO of Microsoft doesn't focus on the remarkable story of his climb from middle-class kid in India to head of an American tech giant. Instead, he explores at length a feeling he's working to cultivate in himself: empathy. It doesn't come as a surprise to people that big names like Facebook, Google, Apple and Amazon are among the five or 10 most valuable companies on earth. But the fact that Microsoft is also on that shortlist surprises people. "I mean, at some level Microsoft is so ingrained in how the world economy works," he says. "It's different than some of the other consumer brands out there." He could have been combative or defensive. Nadella is a company man. (Now 50 years old, he's been at Microsoft more than half his life.) But that's not his style. He's more the quiet, confident type — the guy who never raises his voice or interrupts others; and who makes points playfully. When critics said Microsoft had grown into a fat bureaucracy, Nadella hopped on stage at a major tech conference with an Apple iPhone in his hand — to show off the great Microsoft software in it. The point: Everyone, even the competition, relies on his brand. Asked if he likes playing supporting actor, he says: "Oh yeah, I mean supporting actor role in a world that is increasingly digital is a very comfortable position to be in." That said, he does acknowledge that the culture of Microsoft went downhill. The company had missed the mobile revolution. By the time he became CEO in 2014, critics say (and even Nadella suggests), very smart people at the company had turned very resentful and unmotivated. People stopped caring about what the customer needs, and there was infighting. A cartoonist once made a sketch of Microsoft employees pointing guns at each other (instead of at the rapidly growing competition). Nadella admits in his book: It really got under his skin. There was truth to it. And what he explores is how he's had to work on himself — his capacity for empathy — to change that culture. Despite the wonky title, Hit Refresh is actually a meditation on the soul — his and his company's. He starts with a very personal confession — about the birth of his first child. Nadella was 29 when Zain was born prematurely. While in the womb, the baby got strangled by his own umbilical cord. Doctors had to do an emergency C-section. Just hours earlier, Nadella and his wife Anu, like any new parents, were worried about the usual. "Are we going to have his room and nursery ready? How was Anu going to get back to her architectural job that she'd just started? All of those concerns. 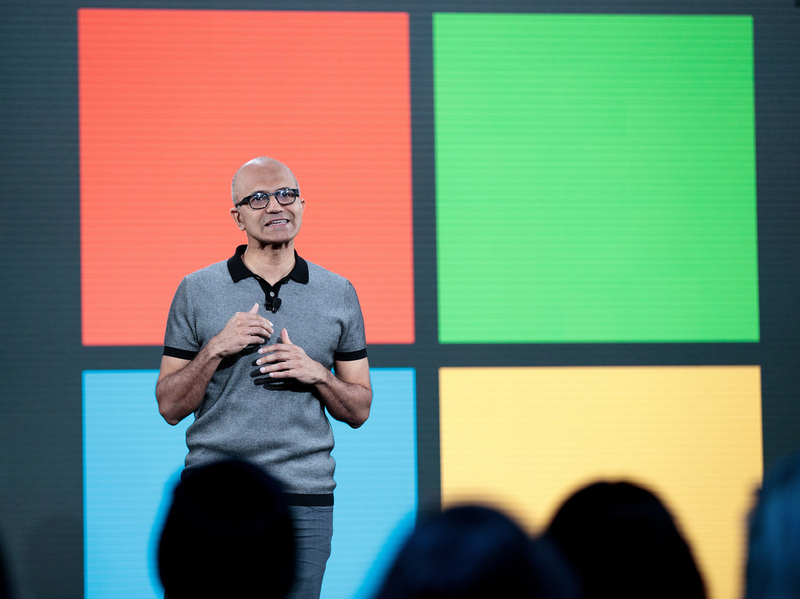 Except our life changed," Nadella says. Zain was born weighing just three pounds and with cerebral palsy. And, here is what Nadella admits: While his wife stepped up, he did not. "Quite honestly, my first reaction was more about 'how could this happen to us?' It was only by watching her — it was not that she was not trying to, in some sense, school me on it," he says, "that I was perhaps able to come to that realization." The realization that it wasn't about him. It was about a newborn fighting hard to survive. And it was Nadella's job to help. This ability to empathize becomes key as he looks at those Microsoft workers who are pointing fingers. His natural reflex, he says, is to judge them, to be annoyed. But then he pulls back and remembers: They're complaining because they're hungry to do more. And it's his job to give them hope. "Those are all things that I've grown in. I don't think that this is all sort of some innate thing that I had." As he describes the many meetings, big and small, where he's had to push himself to be a different leader, he explains how experts from other disciplines have shaped his thinking. Literary theorist Terry Eagleton says culture is "a kind of social unconscious" made iteratively through the everyday customs and practices of people. Nadella, a technologist, says the "razor precision" of that description has helped him pay attention to how simple acts shape a collective mindset. Strategic decisions seem to come more intuitively to Nadella. When he stepped into the CEO position, he very clearly bet on the cloud. He wanted to turn Microsoft into a "cloud first" company that, like Amazon, is a go-to for storing everyone else's data. And, going a step further, he wanted to make Microsoft the company that helps others mine their own data for insights (Facebook and Google shouldn't be the only ones with that superpower). He's also made some very hard, even cold decisions. When Nadella decided Microsoft can't beat Apple or Samsung at making smartphones, he axed his 18,000 employees working on it. How does a man who preaches empathy explain that? "I was thinking of the 100,000 people who work at Microsoft and how the future of this company would be jeopardized if I didn't pick right," he says. CEOs don't typically write books about turning around their companies while they're still doing it. That's exactly what Nadella has done, and in page after page of Hit Refresh, he reflects deeply on the emotional and intellectual reasoning behind his hard choices.